What had started out as a recipe that was going to have steamed clams ended up with mussels after I went to the market and saw that clams were $0.99 each while mussels were only $3.99 a lb. 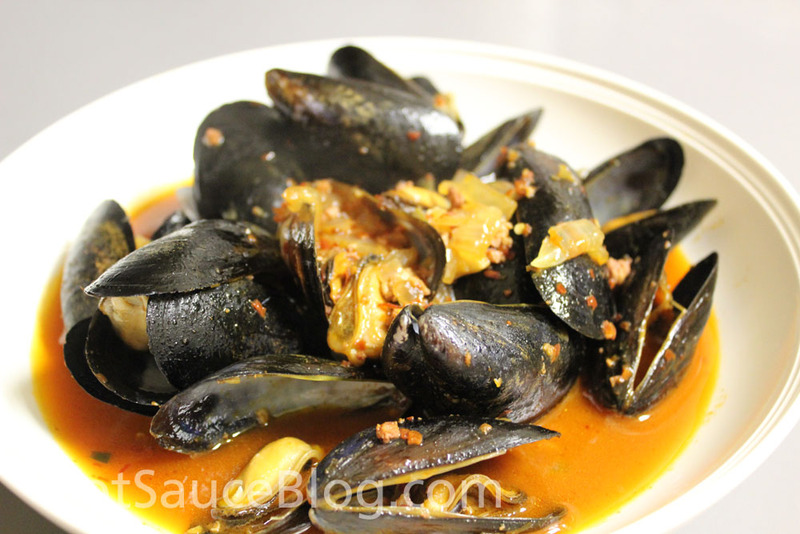 I’ve never cooked mussels or clams before – so this was an adventure and a test in cooking. I had a recipe that I was supposed to follow – but after changing so many ingredients, I’ve only listed the recipe I ended up creating below. It’s spicy, bread-dipping, broth-a-licious. This isn’t just a dish, it’s a full-blown event. You will end up wearing the broth – so don’t wear any white. You will want more – so double the recipe if this is all you will be serving. In a heavy stock pot over medium-high heat, cook the chorizo (remove the casing) until lightly browned. Add the onions and garlic until translucent (about 4-5 minutes). Add the peppers and pepper flakes and cook for another 2-3 minutes. Add the tequila and chicken stock and bring to a boil. Divide the mussels into 2 shallow serving bowls and ladle the cooking liquid over the top – don’t leave anything behind. Squeeze lemon over the top and serve. Make sure to serve with a loaf of crusty bread – it’s key to sopping up all the delicious broth.